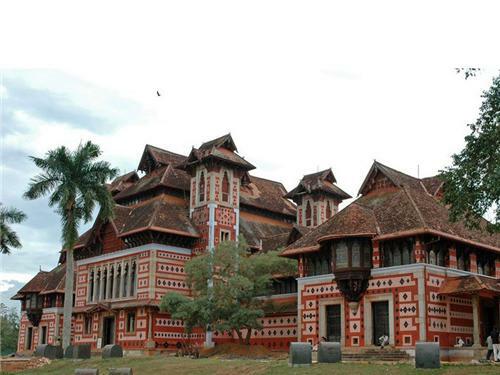 The Napier Museum’s unique architecture, a mixture Gothic gables and Indian minarets combined with red brick exteriors, catches the eye immediately as one goes by on Thiruvananthapuram’s arterial Vellayambalam Road. Designed by Robert Chisholm, it was named after Lord Napier, a governor of Madras. The museum was built in 1855 to house an eclectic collection of rare artefacts. It is the best place where visitors can get a glimpse of Kerala’s rich cultural and artistic heritage. Also known as the Government Art Museum, its building has a system of natural air-conditioning. Its eclectic architectural style draws inspiration from Kerala, Mughal, Italian and Chinese architecture. The museum is set in its own spacious gardens which are an added attraction. Attached to it are a zoo, art galleries, natural history museum and a library, all of which cater to varied interests. The museum’s collection consists of numerous artefacts from all over south India. This includes bronze idols, lamps, temple ornaments, a temple chariot, ivory carvings, stone sculptures, coins, textiles, Kathakali masks and paintings. Among the prize exhibits are an 8th century Vishnu idol, an herbal coat and a 400-year-old clock. The museum’s library is also a treasure trove of rare books and manuscripts and accessible to students, teachers, scholars and researchers. The zoo located within the museum’s premises was established in 1857, making it as one of the oldest zoos in the country. It houses a variety of animals and birds from all over India and countries such as Ethiopia and Australia including royal Bengal tigers, Indian rhinos, Nilgiri langurs, giraffes, hippos, zebras and Cape buffaloes. The zoo served as inspiration for Yann Martel, author of the bestselling Life of Pi. Chithra Art Gallery is attached to Napier Museum. It was established in honour of Maharaja Sree Chithira Tirunal Balavarma Varma who was a great patron of the arts. It boasts original works by masters such as Raja Ravi Varma, Rabindranath Tagore, Nicholas Roerich, Svetoslav Roerich, Jamini Roy and K C S Panicker. It also displays Mughal and Rajput miniatures, paintings from the Tanjore and Bengali schools and reproductions of murals at Ajanta and Sigiriya, Sri Lanka. It also has artefacts from China, Tibet, Japan and Bali as well as ancient palm leaf manuscripts. Additional attractions in the premises are the K C S Panicker Gallery for contemporary art and the Natural History Museum. The museum’s collection includes a variety of stuffed mammals, birds, reptiles, insects, skeletons, fossil tree trunks, minerals and books. The entire premises of the Napier Museum and Zoo also functions as the Thiruvananthapuram Botanical Gardens. Visitors can identify a diverse collection of 200 trees, numerous orchids and ornamental plants, making it a rare oasis in a rapidly modernizing city. How to get there: 2 km away from the city center and easily accessible by bus and auto. Timings: 10 am – 5 pm. Closed on Mondays, Wednesday mornings and national holidays. Entry Fee: Rs. 10 for all above 12 years and Rs. 5 for children below 12 years. Separate entry fees for museum, zoo and art gallery.